OXFORD, Miss. – For the fourth time in five years, a team from the University of Mississippi School of Law has won the national environmental moot court competition. 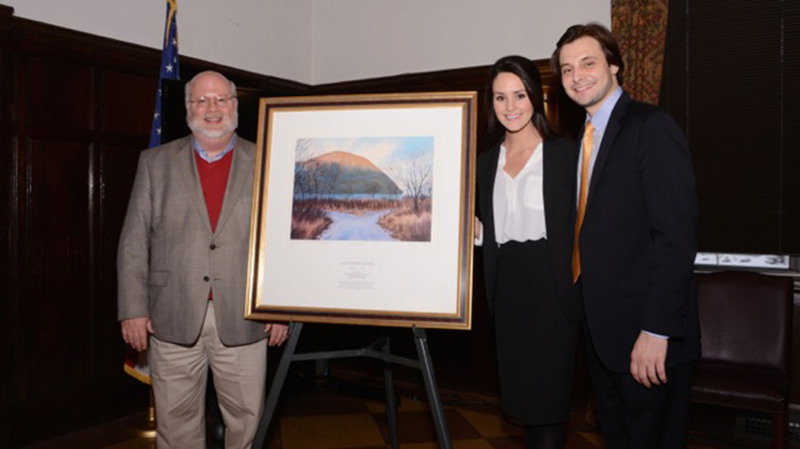 Triumphing over 61 other law schools, Ole Miss prevailed at the 27th annual Jeffrey G. Miller Pace National Environmental Law Moot Court Competition, held Feb. 19-21 at Pace Law School in White Plains, New York. The Ole Miss law school previously brought home the title in 2011, 2012 and 2014. This victory builds on a string of successes for the law school’s advocacy programs, which include four national championships last year alone, a top 14 national ranking for the school’s moot court board in 2014, second place at the National Sports Law Negotiation Competition last fall and a top-8 finish last month at the moot court national championship hosted by the University of Houston. Collecting the trophy for Ole Miss were two second-year law students, John Juricich of Anniston, Alabama, and Mary Margaret Roark of Cleveland, Mississippi. With elimination round victories over Vermont, Montana, Florida Coastal, Penn State, Florida State and Northeastern, the pair advanced out of a tremendous field of law schools, which also included Yale, Columbia, Berkeley and Penn. “The best experience I have had in law school, hands down,” Juricich said. The victory, Juricich and Roark agree, happened only because of the help of many others. Juricich credited the faculty coaches, David Case and Stephanie Showalter Otts, for their work honing the team for competition. The environmental law competition is one of the country’s oldest and most prestigious, testing students on their abilities to argue a mock case before a federal appellate court. The team commenced work on the competition in October, when they started writing their brief. After filing the brief in November, they began to practice oral arguments with their coaches. In New York, the team argued in three preliminary oral argument rounds before advancing to elimination matches in the quarterfinal, semifinal and final rounds. Both Roark and Juricich garnered Best Oralist Awards at the competition. The Ole Miss team faced a formidable panel of judges for the finals, including Patricia M. Wald, retired chief judge on the United States Court of Appeals for the District of Columbia Circuit; Malachy E. Mannion, judge on the United States District Court for the Middle District of Pennsylvania; and Barbara A. Gunning, administrative law judge for the U.S. Environmental Protection Agency. The team’s faculty coaches are both national experts in environmental law. Case’s scholarship focuses on environmental regulation, and he holds a J.D. from Ole Miss and a Ph.D. from Vanderbilt University. Otts, who holds a J.D. and master’s degree from Vermont Law School, directs the National Sea Grant Law Center, a program devoted to wise stewardship of marine resources. “Professors Case and Otts once again proved that the faculty here are amazing,” Gershon said. The UM program’s four victories at the environmental law competition come hand-in-hand with school’s growing reputation as a leader in the specialty, Otts said.